Dashoguz velayat equals 73000 km2 and its population is 1.1 million inhabitants. It is situated in the northern part of Turkmenistan on the left bank of the Lower Amu Darya, in the Karakum desert. The northern part of the-region is occupied by the ancient delta of the Amu Darya River and the Sarykamysh Hollow with a lake, and the southeast part by the Ustyurt plateau. The administrative centre is Dashoguz city. The climate of Dashoguz velayat is sharply continental with hot dry summer and relatively warm winter. Mostly sands with rather poor vegetation as haloxylon, sedge and worm wood cover the territory of this region.The branches of the economy are represented mainly by light and food Industries. Among major enterprises is the cotton spinning mill and construction materials. In the field of agriculture, the velayat is a big supplier of cotton, vegetables, fruits, gourds and grain cultures. Animal husbandry is also well developed. 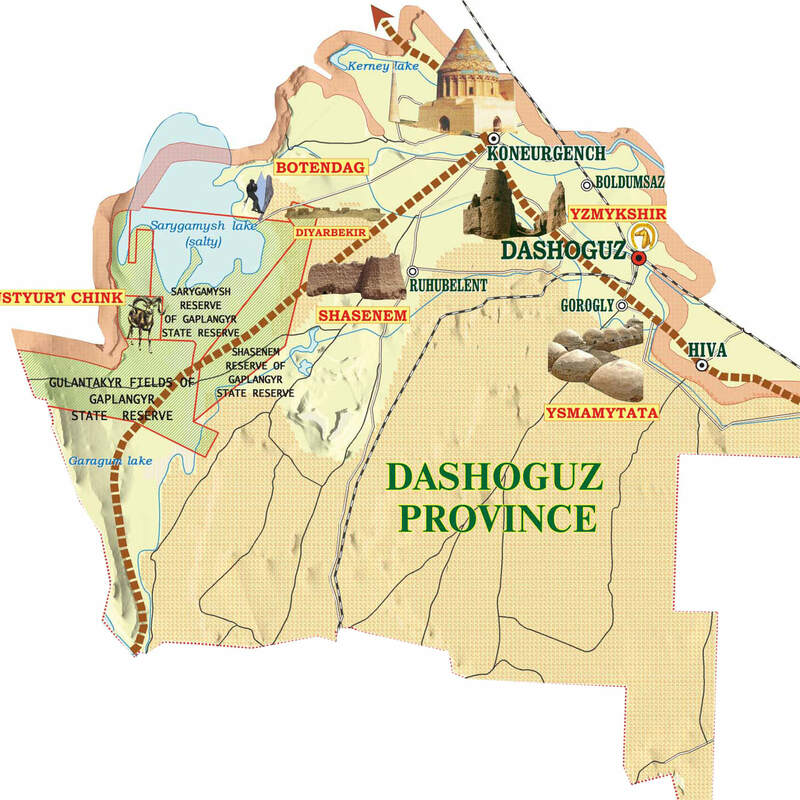 Dashoguz velayat occupies a special place in history and culture of Turkmen land. The unique oriental architectural pearl of the Middle Ages was Urgench city (present Kuneurgench). The biggest diamond in the diadem of religious buildings of Kuneurgench is the remained buildings of the mausoleum of Turebek-Khanim and the minaret of Kutlug-Timur. The majestic power of the magnificent fortresses of Devkasan, Shasenem, Izmukshir, Kenevas seizes every visitor.